Willie D. Jones and Vanessa Green visited the UUCRT on Sunday January 14. Members and friends of the UUCRT showed up in strength to learn about the Black Lives Matter (BLM) Movement and how white people can become better allies. Mr. Jones gave a passionate and challenging presentation during the morning service. He read a selection from his recent book, Today’s Lesson: Black Lives Matter, sang “Lift Every Voice and Sing,” and then spoke on the topic, “In Case You Forgot,” reminding us all, “I am a part of this household; I belong; I matter,” and challenging entrenched myths like “the Horatio Alger bootstrap myth” and the myth of “white industriousness” that he says justify disparity in power. He critiqued those who purport to be “colorblind” and those who hide behind their racial privilege and stay “cloistered on the sidelines.” Mr. Jones called upon white people to wrestle with race and act with courage and integrity in calling out racial injustice in their every day relationships and “overturn the apple carts.” Mr. Jones sold every copy of his book he had on hand to the community eager to learn more and do more. Ms. Jones shared about her activism and the personal threats she experienced while standing up for racial justice after Michael Brown was killed in Ferguson, Missouri. She also spoke about the local issues and opportunities for action. She stressed the importance of “allyship” and encouraged people with white privilege to be shields for those targeted by racial discrimination. Ms. Jones rejected the word “reform” as insufficient and called upon the community to “transform and dismantle” racist systems by being alert and being vocal. As a next step, Ms. Green recommended white people attend the Undoing Racism® Community Organizing Workshop. Rev. Antal and others from the UUCRT committed to participating in the next workshop, April 10, 11, and 12, at Stony Point Conference Center. Registration is reduced to $300 when three or more come from the UUCRT. Please contact Rev. Antal if you would like to attend and register here. Funds to help with the registration fee are available to those in need. Contact Rev. Antal for details. 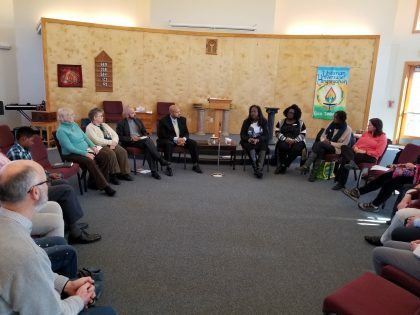 Members and friends interested in continuing the work as part of the Racial Justice Task Force should contact our lay commissioned minister, Terri Pahucki. Members and friends interested in attending an upcoming BLM Hudson Valley meeting should contact Cynthia Gilkerson, who is a member of both the UUCRT and BLM Hudson Valley. The Undoing Racism® Community Organizing Workshop is offered the People’s Institute for Survival and Beyond. Register here. For financial assistance to attend this workshop, contact our minister. Undoing Racism is the signature workshop of the People’s Institute. Through dialogue, reflection, role-playing, strategic planning and presentations, this intensive process challenges participants to analyze the structures of power and privilege that hinder social equity and prepares them to be effective organizers for justice. The multiracial team of organizers/trainers includes more than 40 men and women whose anti-racist organizing expertise includes years with civil, labor and welfare rights struggles, educational, foster care, social service and health reform movements, as well as youth and grassroots community organizing. An average of 10-15 groups per month participate in The People’s Institute Undoing Racism®/Community Organizing process.